You may feel frustrated because of the long-term pain you have been experiencing in your feet due to arthritis, bunions, hammer toes, tendinitis, plantar fasciitis, neuropathies, neuroma's, loss of balance, etc. I have experienced this frustration first hand through countless numbers of my own students who came to my classes to get help from common pains in the feet and loss of balance, due to weak and inflexible feet. I spent several months rehabilitating my own foot when I had plantar fasciitis. I also experienced hip pain when my arch had fallen and did special foot strengthening exercises to build it up again, and now I'm working on a bunion on my right foot. These are all foot ailments that can be corrected and prevented with the right exercises. "I was losing feeling and flexibility in my feet. I love to come and use Jennifer’s foot corrector as it helps to stretch and strengthen my feet and toes." "Jennifer has some wonderful foot exercises that help me to keep my balance. Doing these special foot and lower leg exercises have kept me on my feet and independent living." 3. Pictures and detailed descriptions of how to properly stretch, massage, and strengthen your feet, both with and without special props. 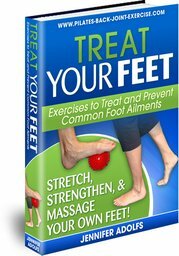 You will have access to loads of pictures and detailed descriptions in this foot exercise ebook. If you try these exercises for 4 weeks and your feet don't feel any better let me know I will refund your money. and just normal functional use. This Ebook takes into account the fact that you may just be doing the exercises in your own home and can use whatever is available to you. 1. Stretching exercises specific to the foot and lower leg. 2. Strengthening exercises specific to the foot, lower leg, and ankle. 3. Balance exercises specific to Aging feet and ankles. 4. Great Pictures and detailed descriptions of every exercise! 5. Free coaching and advice through the contact form on website! 6. Happy Feet Once Again!